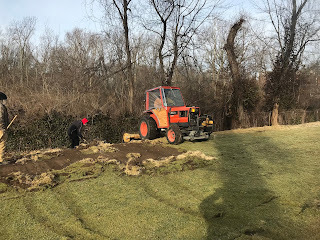 Yesterday, we began the renovation process on #2 white/blue tee. We removed the cool season sod off of the tee surface. We left the zoysia sod on the very front of the tee to allow members to play from that area for a few more days. We have also opened the old winter tee that sits above the 2 oak trees next to the cart path. 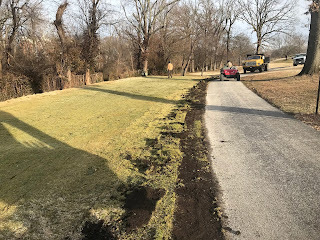 Once this next batch of cold weather has lifted, we will remove the zoysia sod from the front of the tee and begin to dismantle the front area of the tee. The top foot or more of the tee appears to be good top soil so we will cap the two new teeing areas with this soil. 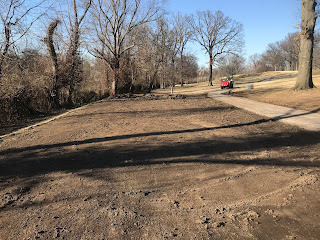 The clay soil underneath will be used to expand the white tee to the right slightly and will be used to fill the back of the blue tee to extend it back another 10 yards or so. The front 15-20 yards of the long runway tee will be removed making two separate tees similar to what we did last spring on #5. We expect to finish grade completed on the tee and sod placed in early April and plan to open the tee sometime in May. Overall tee alignment will be pointed to the up hill side of the fairway and not down the right side of the rough. 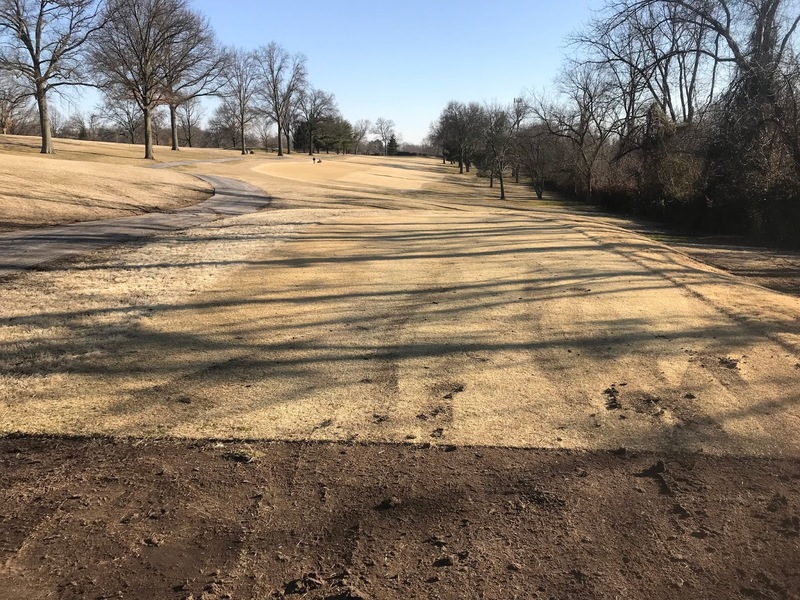 The surface will be all zoysia which requires very few chemical inputs to grow. It will require a bit more light. 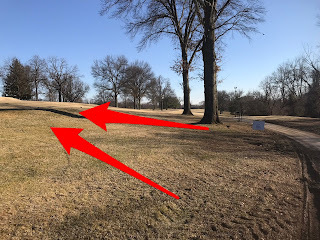 The first Pin Oak has thinned considerably and will need to be removed in the next year or two once it has passed on to help give this tee enough light for proper growth. The overall tee will be reduced in total size. The tee will be raised above grade so that water will go around the tee and not flood the tee as it does now after heavier rain fall. We will be able to get a few more yards distance out of the back tee for championship play as needed. Sod cutter was used to strip off the turf. 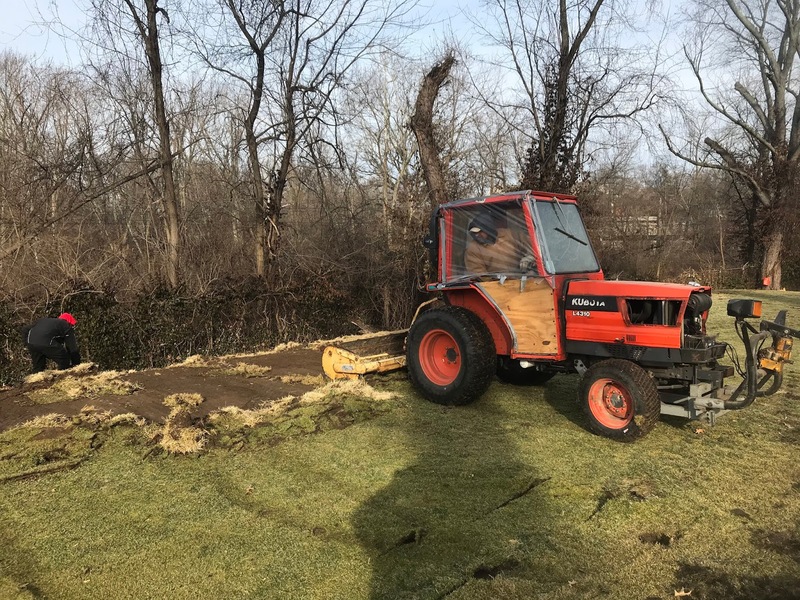 Skip then used tractor to pull sod to the center of the tee for removal. Piled up in the center and used the loader to move into the dump truck to remove from the site. This is the front of the zoysia part of the tee. Still available for play for a few days until we remove it. Plan to use this sod if it holds together on some false front approaches on 7, 10, 13, 15 where we are removing the bent grass. Sod removed and soil exposed.We dug a trench toward the back to allow water to drain through the tee. This same area will be larger as we reconstruct the tee but will be where the two tees are separated. Red arrows pointing toward the temporary tee. The left to right players have had the advantage on this hole. Now, the right handed hook players will have there turn for a couple of months until the tee is ready. Time to learn that strong left hand grip for many of us! The actual view from the temporary tee. Middle of 6 White tee concentrated divot wear. Please use the edges when possible. Greens will be very soft and repairing ball marks would be helpful. Divots on tees and fairways could be large due to the soft, wet conditions. Place your divots back in place, even if it breaks apart. Also, step down your depression which will reduce the exposure of roots to cold and or windy conditions. Your competitors would appreciate it as well in case a ball would roll into your smaller stepped down divot. Of course this is helpful during the growing season as well. 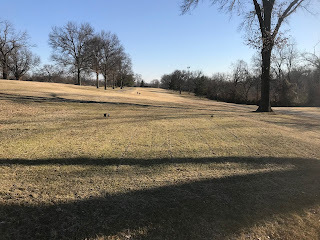 Tee markers will be placed back on the tees in a few weeks but in the mean time use areas of the tee that appear more full of grass, especially the sides. Please don't place your ball in the middle of a heavily divot spot to make one more divot. Place your tee in an area of less damage. 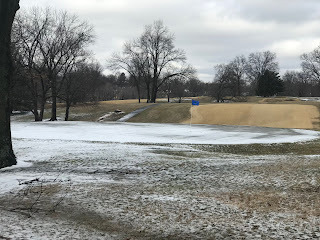 Carts will probably remain on the paths for the near future and I would encourage that you leave all wheels on the path instead of pulling partially off the path. I know if you are in a group with 2 carts, you have to go around a parked cart. If you do pass, it is always best to go on the side of the path away from the fairway so you do not potentially damage rough in the close rough/fairway area. Certain areas of the course are wetter than other areas, especially bottoms of fairways. It might be wise to wait for the group to move instead of burying your cart in a wet spot at the bottom of #12 cart path. Driving ranges are on mats through at least mid-April or later. Please refrain from hitting off the grass tee. If you must hit off grass, please go to another range until we can get our grass growing and open. I don't like to hit off mats as well but its what we have to do since our grass is not actively growing until late April. The less damage we do to our grass now, the quicker we can open in the spring. There is a great deal of work for our staff to complete before we reach the month of April as well. Not a complete listing but some of the main work. Finish all the equipment repairs for tees, driving ranges etc. Continued tree removal and tree trimming. Blowing remaining leaves that have dropped and finishing fence leaf removal. Monitoring seed head production on greens and spraying. Dry-ject(aerate) greens March 18-19 45 tons of sand. Finish applying weed grass post and pre-emergent to fairways. tees. Walk spread pre-emergent around greens and apply by fertilizer hauler pre-emergent into rough areas. Repair greens surrounds with sod and other areas of course with sod and seed. Repair driving range netting by installing new telephone pole. Changing holes, moving tees a couple times a week as needed. Repairs to outside areas around the clubhouse including walkway lights, patio lighting, pool clean up and lawn areas. Growing all of the plants for this season and Becky will be busy cleaning up beds and planting spring pots around the clubhouse. Grass part of dam on #9. Repairing and painting driving range bag stands. These were all home made by the staff a couple of years ago. As you can see, we all have responsibilities that are important for the overall well being of our grand old golf course. 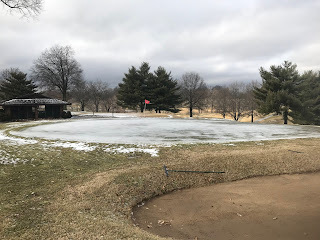 We of course first rely upon you to come out and visit us, first and foremost but while you are here, some player etiquette in regards to the course is always appreciated. Can't really tell where we will be past Friday right now. Think it will probably be too wet but we still have a couple of days of draining to go. 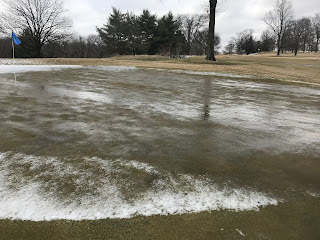 We have some greens completely thawed and others we can't get a probe past the surface. Today's temperatures will help with getting rid of last night's snow/ice pellet cover. Areas east to north facing will probably still have some cover on until Thursday. 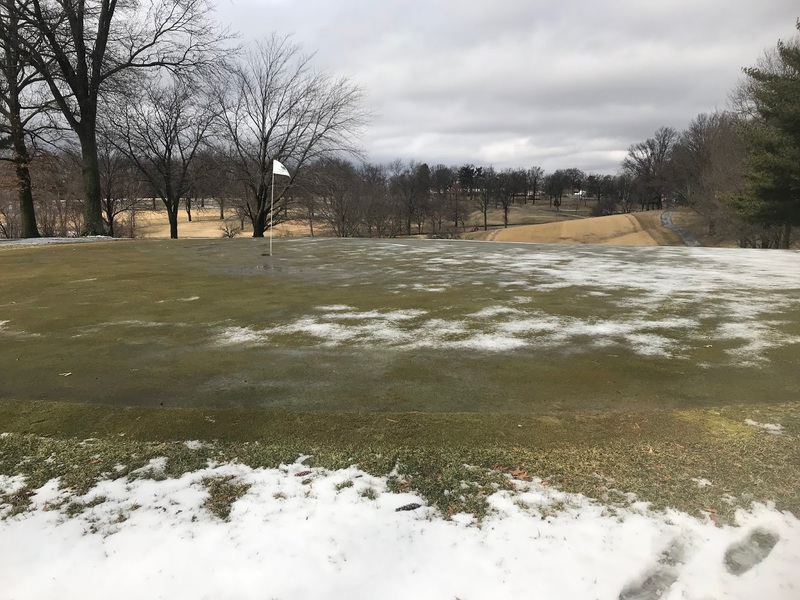 Greens are full of moisture and will not be able to take much as you can see from the pictures during some of the melt. Water is going off the slopped greens over the surface. Sloppy wet in almost all other areas on the course, tees, fairways and rough. Generally a sloppy mess everywhere. Of course these are just snap shots in time. 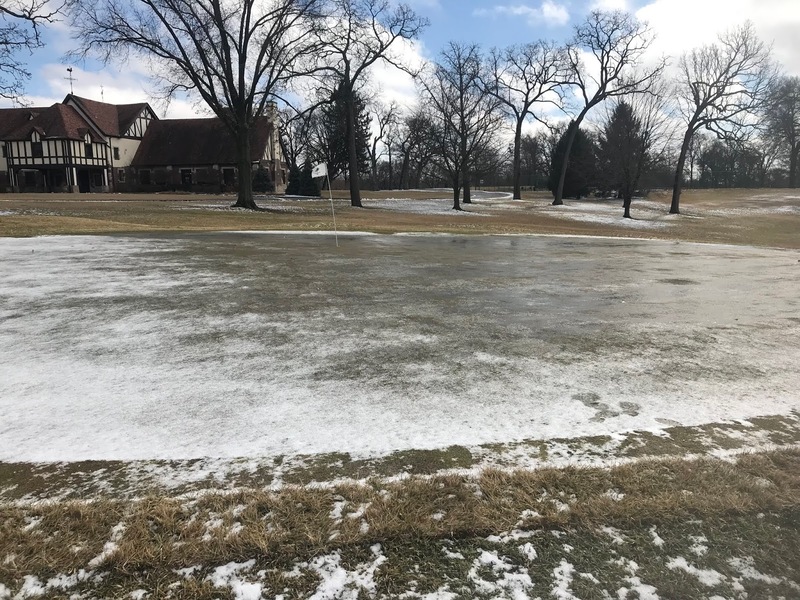 Things will get worse as they completely melt away and the water attempts to move off the greens but they will also continue to drain down. We will evaluate things on Friday for the weekend and will let you know how its going. The process of making Maple Syrup began many years ago for me. My father was a do it all kind of man. He was teacher, coach, and owned a restaurant. During the period of owning a restaurant in the 70's, he had a teacher friend who owned over 1000 acres of land a few miles away from St.Clair. The land was actually closer to Meramac State Park in Sullivan. On this land, I hunted squirrels as a teenager and dad would take me and my brothers deer hunting. My brother Ed still hunts on that property today with family friends. They had a great deal of Sugar Maple trees on property with that amount of acreage. Dad would tap the trees and would use large cooper cooking kettles to boil the sap down. It would take hours and hours to boil this sap down to golden brown delicious home made maple syrup. Great fun sharing time with his friend Martin telling stories and getting away from the day to day troubles that owning a business can bring. My 2nd brother Delmar built a sap boiler in shop class. Just a side note Delmar works for an industrial sheet metal company and did a little work on our greenhouse shaping a small vent for the heat system. He's also worked on many District clubhouses installing new duct work in remodeling projects. 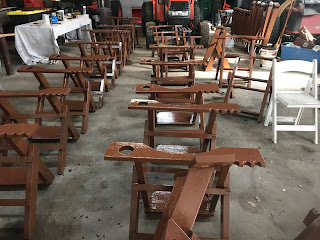 The shop class was taught by his friend Martin who was the owner of the property dad would extract the maple sap from the trees. The boiler had a large rectangle container on top which would hold up to 100 gallons of sap. This was quite the apparatus. It would also not scorch the sap quite as easily as happened on the open flame and copper pots. Our most successful run of maple syrup involved using this boiler. We had over 4.5 gallons of pure gold made. Before he used the large boiler, we would open a bottle and tell mom the syrup didn't taste very good and mom would say well dad must of scorched this batch. Okay, enough of the story telling, now on to present day. Both my Brothers Delmar and Superintendent Ed tapped trees with dad over the years and since on their own with dad being gone almost 27 years. I had never been involved in tapping trees. Finally got the bug when I came to Glen Echo and decided I wanted to do something for the membership and I've done it ever since. There's a nice link to an article on how sap flow works in a tree for those of you who are interested. Tap the link below. We normally have about a 2 week window to tap trees in our area. Temperatures need to be above 32 degrees during the day and below 32 degrees at night. The transition zone creates pretty big swings in temperatures which are different than the northern or eastern climates where maple syrup production are much higher. If we make a large enough supply, Chef will sometimes make it available for a breakfast buffet during the season or will prepare a entree or dessert with the syrup during the season. We have about 12 trees tapped including a couple in my backyard which produce a great deal of sap. Below is a video of the tapping process. last few days of the month. wise and above normal in moisture. Happy Valentine's Day to all the Sweethearts out there. Did verify on a few greens the freeze that is still in the greens. PG, 18 and 2 are from 1" to 1.75" thawed. Checked 1 as well without a video and it is at 1.25". We have some additional cold and moisture driven weather over the next 6-7 days and will then hopefully get the freeze out of the greens and will be ready to have some members and guests out on the course. On the email version I believe the video does not show up but you can hit the link for the green to see the video. 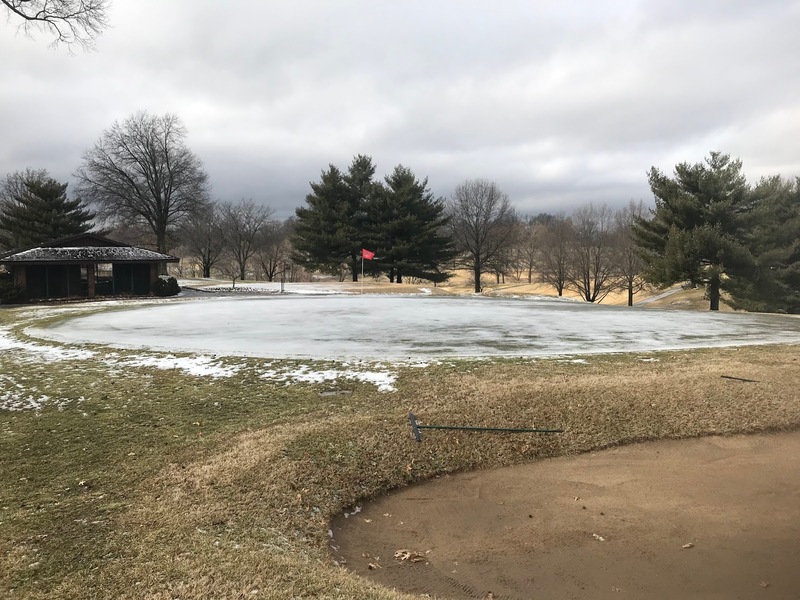 Well, sorry to be the bearer of bad news but conditions remain frozen and or thawing here at Glen Echo. Just beginning to thaw today and I only give it a 1/10 of 1% chance of playing on Valentine's Day so I guess some would say there's a chance. Looks like snow and some colder temperatures over the next few days so golf looks like a no go for a bit longer. We were out spraying some fairways, tees and approaches with our dormant herbicide spray. The turf must be dormant because we are spraying a non-selective product that injures and or kills green weeds and or grass. We are trying to kill any poa annua that has germinated on these surfaces and it also will kill any knot weed that has germinated. It appears the knot weed is still sleeping from the cold weather. 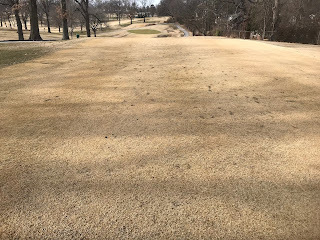 If allowed to grow in the fairways during the spring, poa annua seeds profusely adding the more plants and can get rather clumpy before the fairway units beginning mowing. It also can invade more shaded areas and slow the health and progress of the zoysia Poa becomes active pretty quickly during warmer, sunny weather in the winter to early spring. A few days in a row over 45-50 and it becomes active. The plants will absorb the spray from the warmer weather as it becomes more active. Even if the temperatures turn cold, the chemistry is designed to stick on the leave of the plant and when it becomes active a few days later it will begin to kill the plant. The spray will show up over the next 2-3 weeks by yellowing the plants and will turn orange, brown and then die. Poa annua has a long growing period and reproduces millions of seeds. It loves moisture and shaded areas for the most part but will live in full sun is well so it is very adaptive. We put a second product in the tank that helps to prevent crab grass and goose grass which germinate into the spring and summer. The product we utilize binds itself to the soil which allows it to be sprayed now and is on the soil surface when needed during April, throughout the summer. Microbial activity begins to break down the product by the end of the summer but the zoysia is rather tight and keeps the soil surface shaded. Thinner areas of zoysia can develop some weed infestations because the soil is exposed to light and more moisture which can germinate weeds. We try to place enough product on the surfaces that will prevent weeds from germinating through August into September. We were able to spray holes 1-7 today and the tees associated with those holes. Below is a video with discussion regarding this spray application. The golf course will remain closed through Saturday, February 2nd. We will evaluate Saturday afternoon and Sunday morning to see if conditions allow for opening on Sunday. The Driving Range will be open to come out and hit some balls during the weekend. 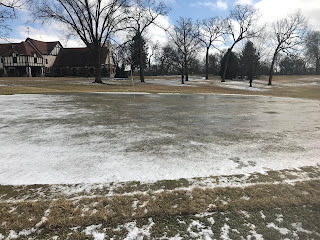 I've been in contact with others clubs in town and some are closed and a few others are open but are on temporary greens. 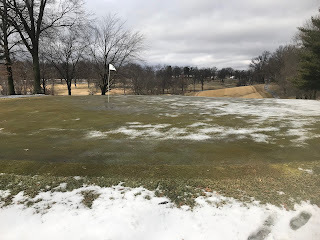 I've posted 3 videos below which show our situation on various greens throughout the grounds as of 1 PM Friday.